Note: "Special Tasks Unit" is a special forces unit of battalion size. Latvian, US, and Afghan soldiers on patrol in Afghanistan. Since 1996 till today the National Armed Forces' soldiers have been deployed on nine international peace-keeping missions in Afghanistan, Albania, Bosnia, Central African Republic, Georgia, Iraq, Kosovo, Macedonia and Somalia. Starting from January 1, 2015, Latvian Armed Forces are taking part in EU's Nordic Battle Group. On March 29, 2004, Latvia became a fully fledged member of the NATO. LATPAT and Multi-LATPAT (Latvian digital camouflage uniform). Glock 26 9×19mm Parabellum Standard issue pistol. SIG Sauer P210 Switzerland 9×19mm Parabellum Used by the National Guard. Heckler & Koch UMP Germany UMP9 9×19mm Parabellum Standard issue submachine gun. 12.7×99mm NATO AW variant used to be the standard issue sniper rifle. PGM Hecate II France 12.7×99mm NATO Standard issue heavy sniper rifle. M16 rifle United States M16A1 Used only as ceremonial weapon by the Guard of Honor of the Staff Battalion. Heckler & Koch G3 Germany 7.62×51mm NATO Ak4 variant used by National Guard. Being replaced by G36. Heckler & Koch G36 Germany G36KV 5.56×45mm NATO Standard issue assault rifle. Rheinmetall MG 3 Germany 7.62×51mm NATO Used by the National Guard. FN Minimi Belgium 5.56×45mm NATO Standard issue light machine gun. Pvpj 1110 Sweden 90 mm Used by National Guard. 100 units, some on motorized platforms. Carl Gustav recoilless rifle Sweden 84 mm  M2 variant used by the National Guard. Samaritan 123 All vehicles will be upgraded and overhauled. Some of them will be equipped with SPIKE anti-tank guided missiles. Polaris RZR United States FAV MRZR-2MRZR-4MV850 62 Option for up to 130 vehicles. Bv 206F ~100 Donated by Sweden in 2002 and 2003. 155 mm 47 Mobile artillery system's M109A5Ö A-type howitzer, which is a modernized version of A2 and A3 howitzer with 39-calibre M185 barrel. Their range is 22 km with conventional munitions and 30 km with improved conventional munitions. FIM-92 Stinger United States Purchased from Denmark. Giraffe Sweden PS-70 Used for guiding RBS-70 fire units. AN/MPQ-64 Sentinel United States AN/MPQ-64F1 4 Donated by the U.S. through the European Reassurance Initiative. 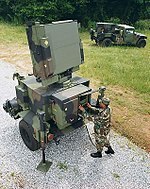 Two radars used in conjunction with the RBS 70 air defence system. AN/FPS-117 United States AN/TPS-77 6 Used in Baltic Air Surveillance Network. 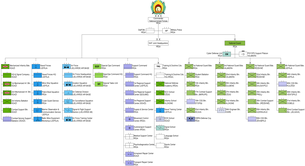 The rank structure of the Latvian army is adjusted to the rank structure of the NATO countries in Europe. Rank insignia are worn historically on the collars and today also on shoulder marks. Starting 2016, only the Staff Battalion wears the collar insignia. ^ "Simbolika". Nacionālie bruņotie spēki. Retrieved 30 September 2015. ^ "Nacionālie bruņotie spēki". Retrieved 28 July 2016. ^ Indrēvics, Gatis (12 December 2018). "Artilērijas diviziona karogs pēc 14 gadu pārtraukuma atgriežas Ādažu bāzē" (in Latvian). Sargs. ^ "Nacionālie bruņotie spēki". Retrieved 24 December 2014. ^ "Member countries". Retrieved 24 December 2014. ^ a b c d e f g h "Par ieroču modeļu noteikšanu un iepirkumu Nacionālo bruņoto spēku vajadzībām". likumi.lv (in Latvian). 28 July 2005. ^ a b c d e f g h i j k "Faktu lapa "Nacionālie bruņotie spēki" (2008)". www.mod.gov.lv (in Latvian). ^ a b c d e f g h i j k l m n o p q "AM sagatavojusi jaunus armijas ieroču standartus". www.tvnet.lv (in Latvian). LETA. 12 July 2018. ^ a b c d e Tupp, Enn (2018). "Zemessardze - KASP-i ja Kaitseliidu vääriline partner". Kaitse Kodu! (in Estonian). Kaitseliit. 1: 34. ISSN 1406-3387. ^ "Latvia's National Guard receives G36 rifles". www.shephardmeida.com. 31 May 2017. ^ "NBS par 1,8 miljoniem eiro iegādāsies 'Browning M2' ložmetējus". www.delfi.lv (in Latvian). BNS. 21 December 2014. ^ "Latvian army with US support to receive EUR 2.4 million worth of drones". Retrieved 16 April 2018. ^ "Latvia acquires Penguin C long-endurance UAVs". Retrieved 19 April 2019. ^ "Latvian army purchases UK armoured combat vehicles". Retrieved 24 December 2014. ^ "Latvia to continue purchases of Spike anti-tank missiles". Retrieved 12 January 2015. ^ "Latvijas armija saņems ar ASV atbalstu sagādātus 62 taktiskos transportlīdzekļus" (in Latvian). delfi.lv. Retrieved 6 Feb 2018. ^ a b "All 47 howitzers bought from Austria are now in Latvia". eng.lsm.lv. 18 October 2018. ^ "Latvia to buy anti-tank weapons, armoured vehicles from Norway". Retrieved 24 December 2014. ^ "Latvian soldiers leave for the operation in Central African Republic". Archived from the original on 8 February 2015. Retrieved 24 December 2014. ^ "Bruņotie spēki saņem Norvēģijā pirktās automašīnas un ieročus" (in Latvian). Retrieved 31 May 2015. ^ [hhttps://www.tvnet.lv/4514810/brunotie-speki-no-somijas-iegadajusies-6x6-bezcela-transportlidzeklus "Bruņotie spēki no Somijas iegādājušies 6x6 bezceļa transportlīdzekļus"] (in Latvian). 15 June 2018. ^ Kristovskis, Gatis (12 June 2018). "Latvia to buy parts of used all-terrain carriers from Sweden for EUR 5.7 million". LETA. ^ "Latvia to procure nearly fifty used howitzers; first ones to be supplied in autumn". Retrieved 22 February 2017. ^ "Another NATO Country Buys RBS 70". www.defense-aerospace.com. 25 November 2004. ^ "Latvia to Buy Stinger Air-Defence Systems". www.defense-aerospace.com. 22 August 2017. ^ Eglīte, Džoanna (5 October 2016). "Latvian skies protected by advanced radars". www.mil.lv. ^ "Latvia awards Lockheed Martin $44 million contract for two long-range air surveillance radars". ^ "Latvia buys TPS-77 multi-role radars from Lockheed Martin". 5 October 2015. ^ "Latvia Latvian Army ranks military combat field uniforms dress grades uniformes combat armee lettone - Army Recognition - Army Recognition". Retrieved 24 December 2014.